Note: The 1044_0B is identical to the 1044_0, except that it comes pre-assembled in a plastic shell enclosure and you have the option of which length of USB cable you want to include. The PhidgetSpatial Precision 3/3/3 combines the functionality of a 3-axis compass, a 3-axis gyroscope, and a 3-axis accelerometer all in one convenient package. It has enhanced precision in the accelerometer when measuring less than ±2g, and enhanced gyroscope precision at speeds less than 100°/s. The transition from high precision to low precision mode and back is completely seamless and automatic. 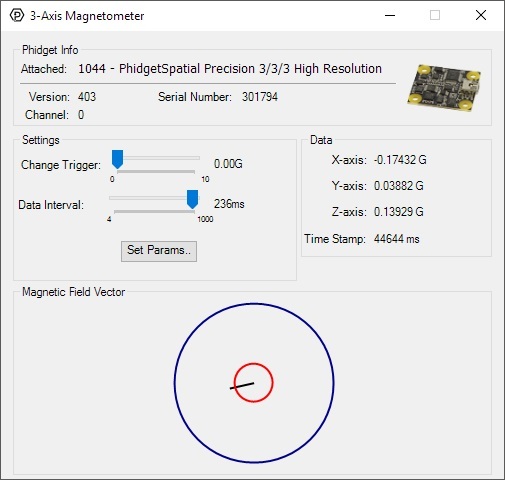 If precision is not an important factor for your application, consider the 1042 - PhidgetSpatial 3/3/3 instead. 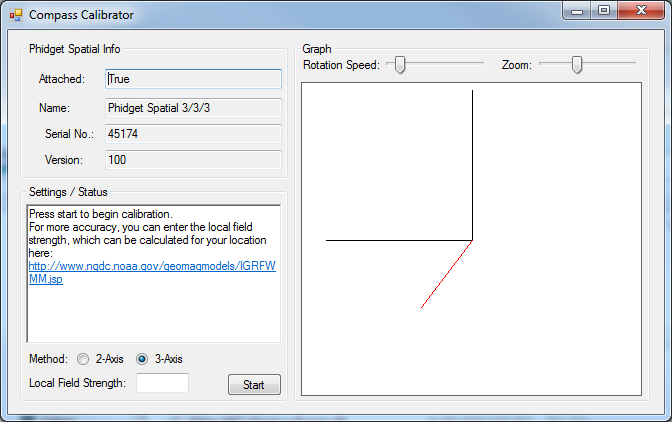 Graphical Compass Calibration Program (Windows). Command Line Compass Calibration Program (Linux, OS X). Now that you have everything together, let's start using the 1044! 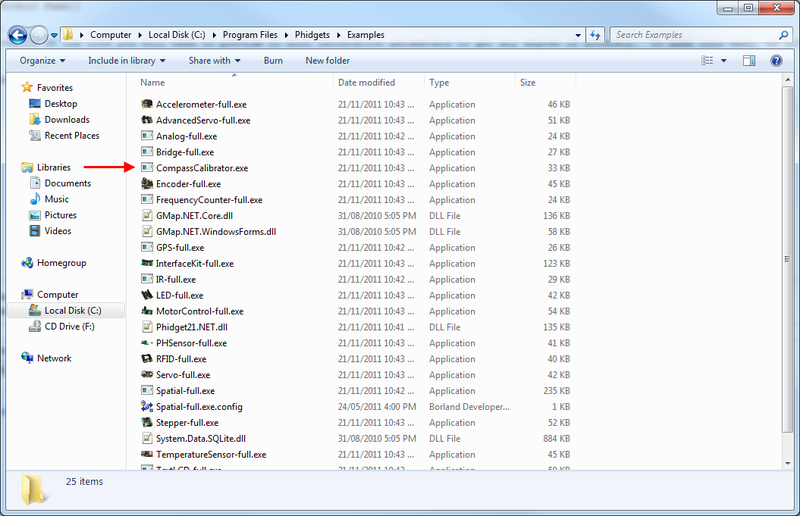 In order to demonstrate the functionality of the 1044, the Phidget Control Panel running on a Windows machine will be used. Linux users can follow the getting started with Linux guide and continue reading here for more information about the 1044. The measured values reported in g-force can be seen via labels as well as graphical dials. Try tilting the 1044 in different directions to see the labels and graphics change. The measured values reported in degrees per second can be seen via labels as well as graphical dials. Try rotating the 1044 in different directions to see the labels and graphics change. When the 1044 measures an acceleration value with magnitude less than 2g, it will acquire its data from a higher precision accelerometer chip. For these measurements, the average white noise on each axis will be reduced by approximately a factor of ten, and the resolution will increase from 976 μg to 76 μg. Likewise, when the gyroscope measures a rotation value with magnitude less than 300 °/s on the Z-axis or 400 °/s on the X or Y-axis, the noise per axis will be approximately six times lower, and the resolution will increase from 0.07 °/s to 0.02 °/s. 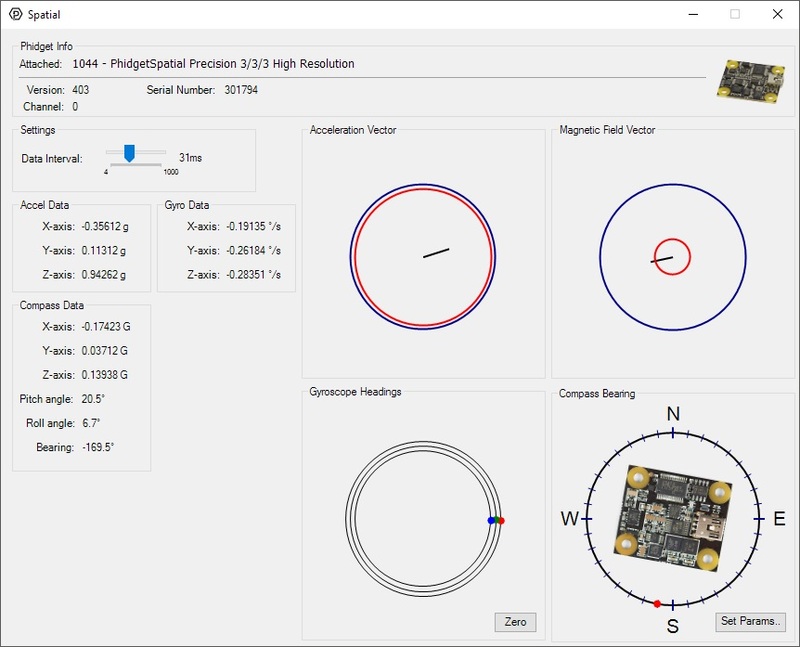 The transition from normal to high precision or vice-versa is seamless, with no additional code or equations needed. 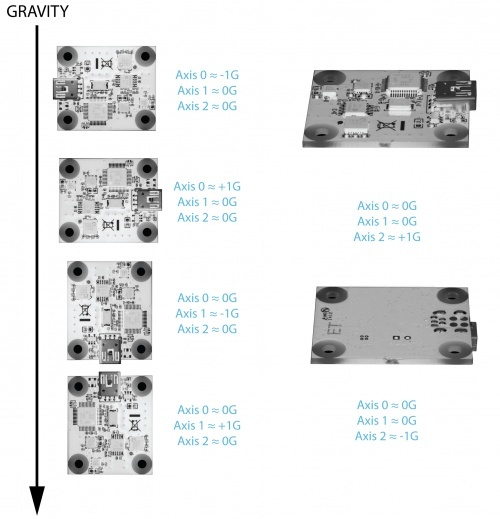 The 1044 has a 3-Axis accelerometer that can measure ±8 g's (±78 m/s2) per axis. It will measure both dynamic acceleration (change in velocity) and static acceleration (gravity vector). 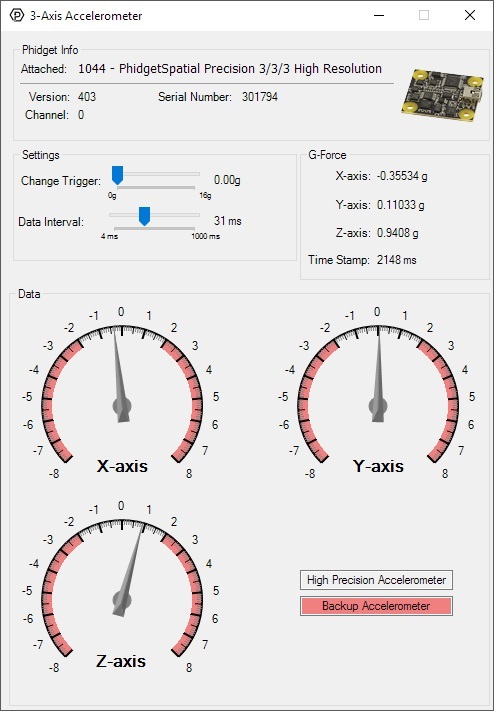 When working with an accelerometer it is important to know which is the positive and negative direction on each of the axes. 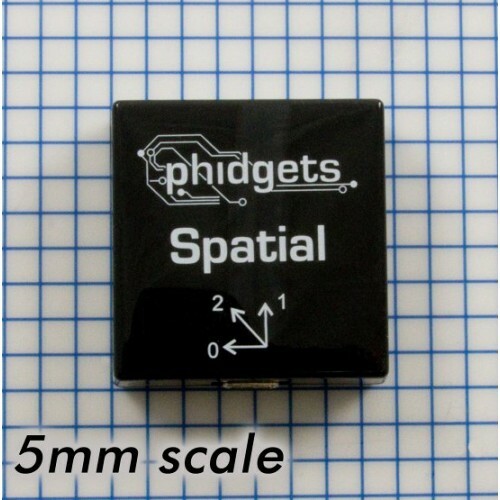 This can be determined by orienting the accelerometer along each axis and checking the output. The above image shows what the axis readings should be for each orientation of the 1044. 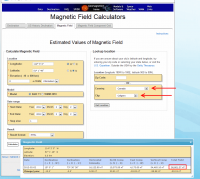 The magnetometer reports the sum of all magnetic fields acting on the 1044. The earth's magnetic field is only one source that affects this measurement. 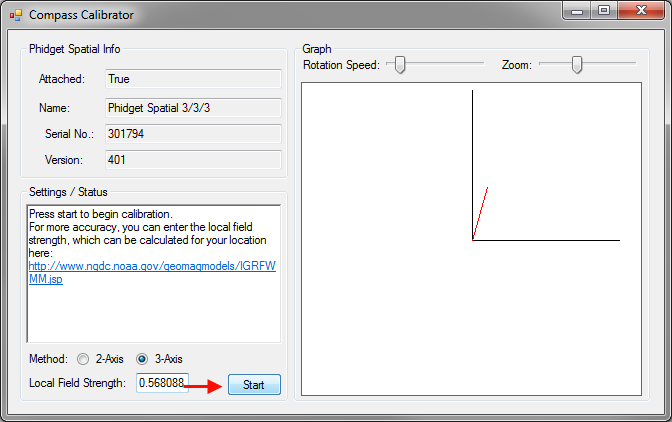 In order to get accurate bearing data from the magnetometer - (i.e. to find magnetic north as a compass) any interfering magnetic effects need to be calibrated out. For more information about calibration, see the section below, or the Compass Primer. 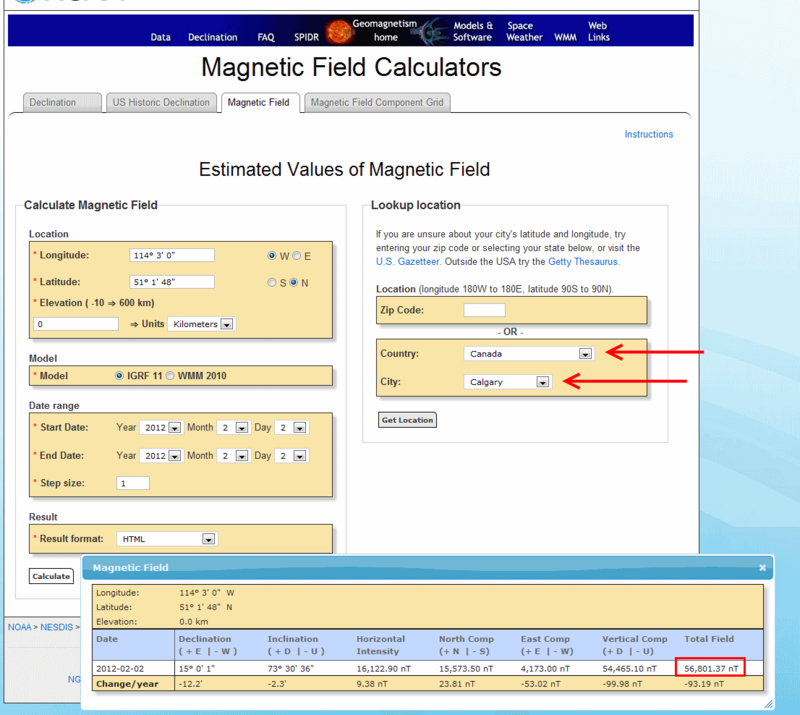 Any magnetic field that is stationary with respect to the 1044, and less than ± 3 Gauss, can be calibrated out of the magnetic field measurement. This includes both hard and soft iron effects caused by nearby ferrous and magnetic materials. Interfering magnetic fields that vary in strength and orientation with respect to the 1044 cannot be easily calibrated out. 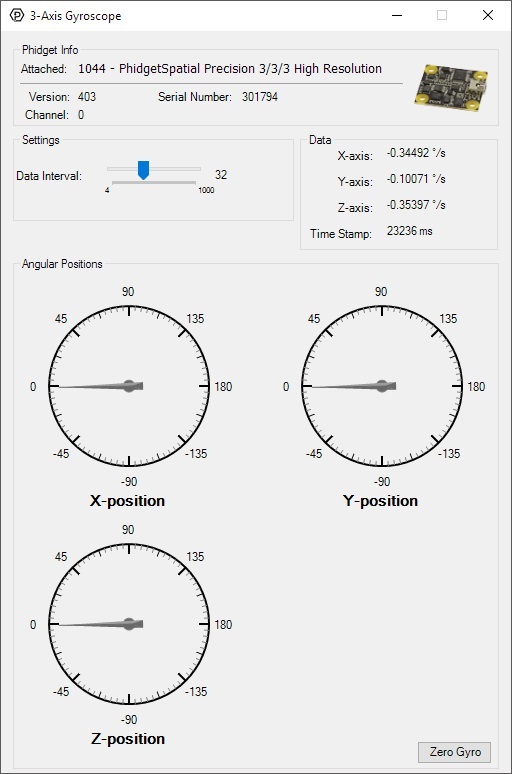 In order to get numbers of useful accuracy from the 1044's compass you will need to provide calibration parameters. To make determining them easy, we distribute a program with our drivers that does this for you. Depending on what your application is this step as well as the next step might be a bit different. If you are intending on mounting the 1044 onto a large vehicle such as a car then you should mount the 1056 securely to the vehicle in its final intended position then check the 2-axis bubble, click the 'Start' button. 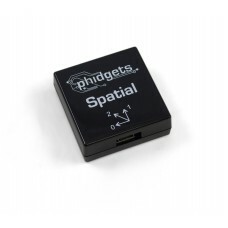 If you are using a smaller, more easily handled vehicle such as a small robot (something you could physically pick up) you will mount the 1044 and use the 3-axis calibration instead. Click 'Start'.